This article is about the historical region of Aśmaka. For the kingdom in Indian Epic Literature, see Asmaka Kingdom. Assaka (Pali) or Ashmaka (IAST: Aśmaka), was a region of ancient India (700–300 BCE) around and between the river Godavari. It was one of the shodasa (sixteen) mahajanapadas in the 6th century BCE, mentioned in the Buddhist text Anguttara Nikaya. 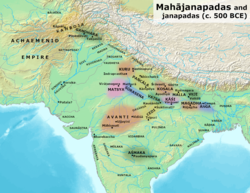 Assaka and other Mahajanapadas in the Post Vedic period. The capital is variously called Potali, or Podana, which now lies in the Nandura Tehsil. The Buddhist text Mahagovinda Suttanta mentions about a ruler of Assaka, Brahmadatta who ruled from Potali. The Matsya Purana (ch.272) lists twenty-five rulers of Aśmaka, contemporary to the Shishunaga rulers of Magadha. Later, the people spread southward to the territory of the Rashtrakuta empire, which is now in modern Maharashtra. Ashmaka is also identified as Assaka and Aśvakas in Buddhist literature and Gatha Saptashati of king Hāla. ^ Gupta, Parmanand (1989). Geography from Ancient Indian Coins & Seals. Concept Publishing Company. ISBN 9788170222484.